The well preserved settlement may date back to the Iron Age and was probably a small farming community, archaeological evidence suggests it was occupied up to the Romano-British period. Several of the hut walls still survive to a height of around six feet (2 metres), and an entrance is visible on the north-east side of the enclosure. The houses, stone walls and defences consist of limestone slabs, standing up straight on their edges. Excavations on the site revealed that the round structures were probably houses and the rectangular ones barns or workshops. 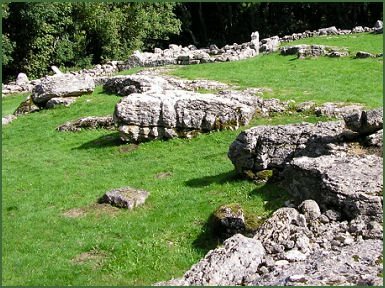 In one corner stand the remains of a large and impressive house, a well-built circle of large limestone slabs with steps leading up to the entrance. This was the principal domestic building, a silver ingot, pottery and glassware have been discovered at the building. One of the rectangular buildings was found to contain large amounts of metallic slag as well as remains of several hearths with charcoal formed from oak. It was evidently a workshop for the smelting and working of iron. The site was defended by a small but strong wall of limestone blocks, measuring 4 - 5 feet thick, Din Lligwy covers half an acre and great deal remains including the enclosing wall and the foundations of many buildings. The outer protective wall is almost intact although much reduced in height. The principal period of occupation was during the 4th century AD. Excavations in 1905 -07 produced hundreds of Roman pot sherds of the 3rd and 4th Centuries AD, many repaired with iron clamps. The site stands on a low cliff with good views over Anglesey. 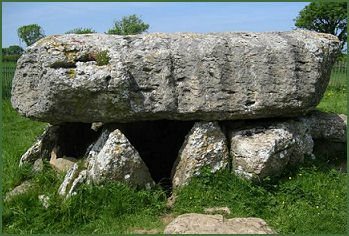 The burial chamber or cromlech at Din Lligwy is situated a few metres from the road and dates back to the Neolithic period, at the end of the 3rd millennium BC. 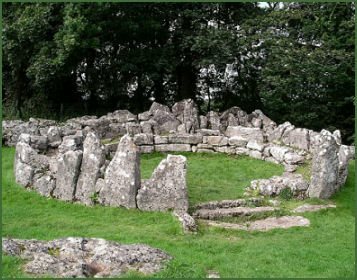 The chamber consists of a circle of upright stones capped by large stone, known as a capstone. The massive capstone, measures 18 by 15 feet and weighs around 25 tons. It would originally have been covered with a mound of earth or stones, with access to the central chamber through a small passage. The chamber was excavated by E. Neil Baynes in 1909, when the remains of 15-30 people and pieces of beaker and pottery were unearthed. Take the road signposted Din Lligwy from the roundabout on the A5025 south-west of Moelfre. After passing the Neolithic burial chamber, the road widens and there is space to park. Follow the footpath which leads past Capel Lligwy. 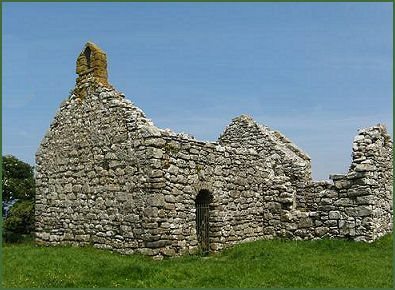 The ruined chapel of Capel Lligwy or Hen Capel Lligwy (Old Lligwy Chapel) as it is sometimes known, stands adjacent to the path that leads to the Din Lligwy hut circle. The church dates back to the twelfth century, when the Viking raids on Anglesey ceased, which lead to increased stability and prosperity on the island. At this time many of the old churches on Anglesey, previously built from timber, were replaced by stone buildings. The church, which is now roofless, stands in an isolated spot overlooking Lligwy Bay. Nothing is known of its history, nor to which saint it was dedicated. The south doorway and the base of the walls are 12th Century, the upper sections of the walls were rebuilt in the 14th century and the south chapel was added in the 16th century, a flight of steps leads to a small vault beneath it. The vault was used to bury members of a local family, the Pierce Lloyds. Part of the churchyard wall still remains, revealing that it was originally within a mainly circular enclosure, as is often found with early churches. By the end of the 18th century it had fallen into a state of disrepair.